Kyra Norstrom’s path to setting a new Holiday Swim Club record in the pool began at home, competing with her 5-year-old sister, Eirelyn, on who could eat breakfast or get dressed first. And the desire to win doesn’t end with her sister. “My mom is super competitive and my dad is competitive but only in certain sports. I’m only competitive in swimming,” Kyra clarified. 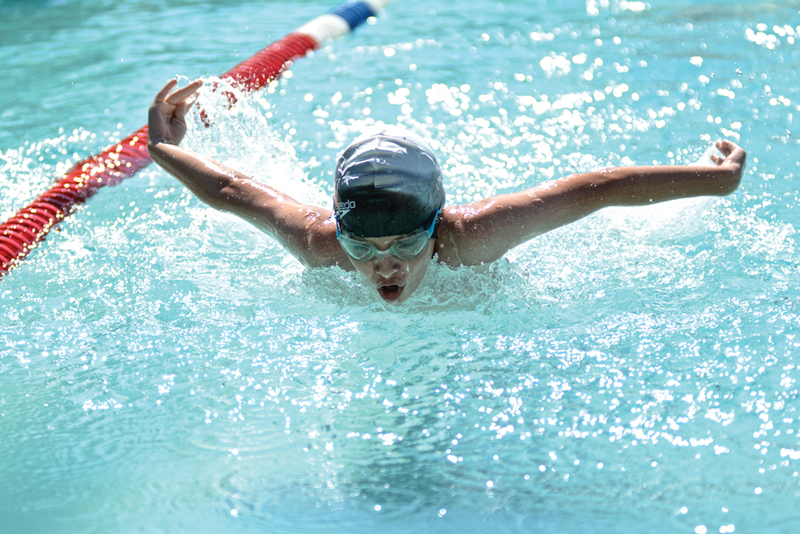 That competitiveness paid off Thursday, July 6 at the Northview Terrace pool as the elder Norstrom swam a club record 15.28 seconds to win the 11-12-year-old butterfly. Norstrom, 11, joined the Holiday Swim Club last summer after the family moved to Keizer from Eastern Oregon.While it was her first team, Norstrom did take lessons in La Grande. Norstrom has come a long way since starting with Holiday, especially her diving. Norstrom also won the 11-12 girls backstroke at Northview in 36.06, two seconds faster than she swam last summer, and the freestyle in 29.82. Norstrom credited her coaches and of course her competitiveness for the swift improvement. “Sarah (Eckert) and Cody (Luth) and Kylie (McCarty) pushing me and for me to beat all my friends is really fun,” Norstrom said. Alex Wilcoxen’s success in the pool also comes from her family. Her mother was previously the head coach at Holiday and her father currently serves as the club’s president. Along with breaking her own record in the 9-10 girls butterfly in 15.06 seconds, Wilcoxen also won the breaststroke in 45.65 and the individual medley in 1:19.62. A strong start was key. Wilcoxen and Norstrom’s swims helped Holiday defeat Northview 337 to 232. Evylyn Hales had the fastest times in the 7-8 butterfly and backstroke. Emery Love won the 9-10 backstroke and Emma Anderson took first in the 100 free. Erika Robinett won the 11-12 breaststroke. Alex and Bella Beard dominated the 13-14 girls division. Alex won the IM, the fly and the breaststroke. Bella won the backstroke and the freestyle. McCarty had the fastest times in both the 15-18 free and the fly. Hannah Williams won the breaststroke. Holiday swept three relays. Hales, Turner, Ava Privratsky and Claire Hicks won both the 7-8 free and medley relays. Ella Gerig, Cassidy Kerner, Wilcoxen and Anderson did the same with the 9-10 relays as did Alex and Bella Beard and Abby Grossman and Emma Privratsky in the 13-14 division. Robinett, Jaelynn Love, Maya Privratsky and Abby Grossman won the 11-12 free relay. Williams, Delaney Rothmeyer, Sydney Bethers and Rosa Oliver finished first in the 15-18 free relay. Holiday’s boys scored 106 points at Northview. Jacob Castronovo earned a first place ribbon in the 7-8 IM and the fly in 25.34. Jonah Strunk won the breaststroke. Vinny Arnold won two events in the 9-10 division, swimming the breaststroke and the free. Joshua Grossman took first in the butterfly. Hayden Keizer swam the fastest time in the boys 13-14 backstroke as well as the free.Jack McCarty won the fly and the breaststroke. Tony Gonzales touched the wall first in the IM. Gonzales, McCarty, Keizer and Ryan Bethers had the fastest time in the 13-14 relay. Gonzales, McCarty and Bethers also teamed up with Nathan Williams to win the medley relay. Payton Burlingame, Noah Schaffner, Ryan Burger and Xavier Grantham placed first in the 11-12 free relay. Strunk, Castronovo, Noah Williams and Dylan Somphone won the 7-8 medley relay. Northview’s boys recorded 144 points. Alex Kosiewicz took home five first place ribbons, winning the 15-18 IM, free and breaststroke. He also swam on the fastest medley and free relays with Hayden Wampler, Gavin Gasperini and Jeremy Becker. Becker also won the 11-12 back and breaststroke. Wampler took first in the 13-14 backstroke. Tyler Barker finished first in the 7-8 backstroke and freestyle. Zach Kilby touched the wall first in the 11-12 free and fly. Eli Staley won the 11-12 IM. Staley, Ethan March, Kaden Chanthalangsy and Luke Stucker won the 11-12 medley relay. Michael Halliday, Will Oglesby, Nick Kosiewicz and Xzavier Parker took first in the 7-8 free relay. Northview’s girls chipped in 88 points. Mary Ann Halliday won the 7-8 breaststroke. Izzy Kosiewicz, Izzy Kilby, Ava McNeely and Ashely Stucker had the fastest time in the 11-12 free relay. Kat Kosiewicz, Sydney Epperly, Ana Sponable and Erin Seyfried touched the wall first in the 15-18 free relay. Northwood’s boys were able to outscore Madrona but the Keizer swim club came up short as a team, falling 364-262 on Thursday. The boys accounted for 158 points. Grant Schaffer and Cale Skipper won the 9-10 and 11-12 IM. Andrew Zeller and Jabez Rhoades took first in the 9-10 and 15-18 free. Madden and Hudson Hughes had the fastest times in the 7-8 and 9-10 butterfly. Zander Rhoades won the 13-14 fly. Ben Diede, Pierce Walker and Gavin Eisele won the 9-10, 11-12 and 13-14 backstroke. Zeller and Eric Olsen placed first in the 9-10, 13-14 breaststroke. Diede, Hughes, Cameron Harrington and Caedmon Christensen had the fastest time in the 9-10 medley relay. Hughes, Harrington, Christensen and Jeffery Olsen won the 9-10 free relay. Walker, Schaffer, Zachary Harrington and Kelson Whalen took first in the 11-12 medley relay. Zeller, Skipper, Elijah Clendening and Carson Biondi won the 11-12 free relay. Eisele, Bryce Junker, Easton Hughes and Logan Ready swept the 13-14 medley and free relays. Northwood’s girls added 104 points. Individually, Brooke Junker won both the 11-12 free and backstroke. Paris Boyd took first in the 15-18 fly and breaststroke. Ashley Hawley and Alyssa Garvey won the 13-14 and 15-18 free. Kaily Wells won the 13-14 IM and Kailey Wilcke finished first in the 13-14 backstroke. Northwood won two relays. Hawley, Wilke, Junker and Kaitlynn Roop had the fastest time in the 13-14 medley relay. Boyd, Garvey, Emily Alger and Rioanna Zeller then placed first in the 15-18 medley relay.